Verdict: LILY WHITE LIE is an engagingly written mystery featuring a capable leading lady that mixes a sense of danger with small-town politics and historical intrigue. Wrenn Grayson is an amateur historian and a part-time employee at City Hall. Her long-time boyfriend, Gideon, is away on a hunting trip when a stranger shows up claiming he’s Bret Kilmore, Gideon’s best friend. Bret demands to stay at Wrenn’s house because he has important news regarding Gideon’s estranged father that can only be relayed to Gideon. While Bret tags along with Wrenn to her get the local Christmas festival ready, the church’s new priest asks Wrenn to find the rightful owners of a very old pocket watch. As the political drama around the festival heats up, so do the leads on the pocket watch, but someone seems to be watching them; mysterious notes on lilies are being left on Wrenn’s car and the messages mean that everyone is a suspect. 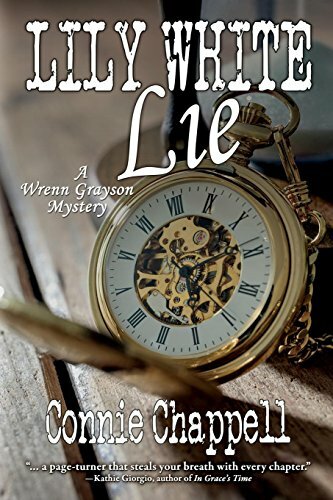 Connie Chappell’s LILY WHITE LIE is the third installation of the Wrenn Grayson series, but it can be read without having missed anything from the first two books. It’s a great cozy mystery that shows how small-town political drama can lead to wondering how well one really knows their neighbors—and if they could be capable of dangerous actions. Wrenn is fierce in her love for her town and knows how to stand up for what’s right, even if it’s inadvertently putting her in harm’s way. The only issue that is hard to get past is Bret Kilmore. Why does Wrenn let a stranger into her home while Gideon is gone? Just because she’s heard of Bret from Gideon’s stories doesn’t mean she knows him, and he’s far too flirtatious with her to be respectful to Gideon’s absence and her being alone. Bret and Wrenn end up sharing her home and her car for the entire week, all while he refuses to share any of the information he claims to have, which is the only reason she’s letting him stay. LILY WHITE LIE would have stood on more solid ground if Wrenn had met him before. And any red herrings given in the book later are not worth the suspense of Bret’s inability to share his reasons for being there. Despite the ending feeling rushed, the writing is incredibly engaging, and the dialogue and imagery of the town is wonderfully conveyed. Wrenn is certainly a capable leading lady, and it would be fun to delve back into her world and see what mystery she winds herself up in next. LILY WHITE LIE is an engagingly written mystery featuring a capable leading lady that mixes a sense of danger with small-town politics and historical intrigue.